I acquired this specimen recently. 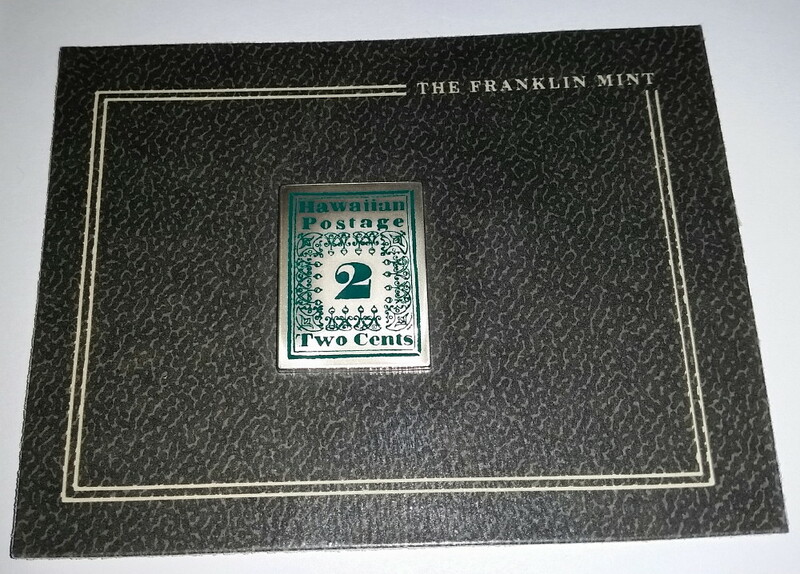 This is a Franklin Mint issue from The World’s Most Valuable Stamps set. 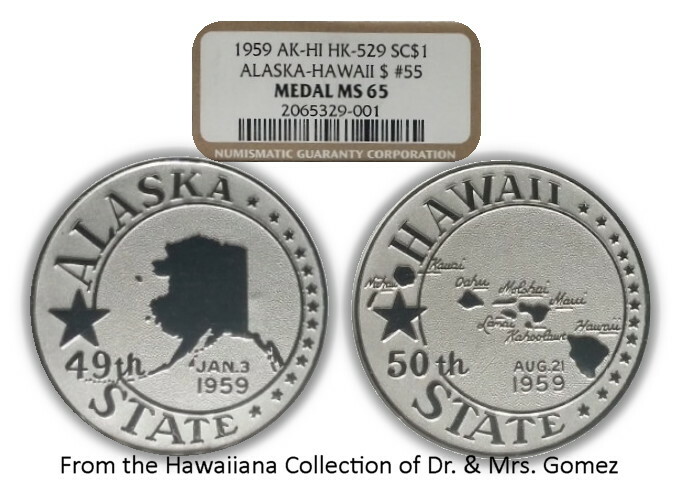 Replica stamps in sterling silver and colorized was first issued in 1986. A total of 25 stamps are in the set. Mint in Package (MIP). 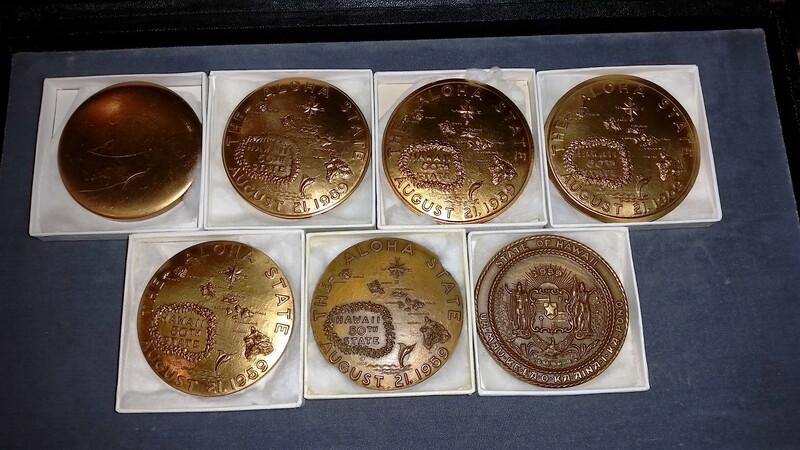 I’m an advocate to collecting MIP Franklin Mint items (kept in pristine condition). 1- 3/16 inch X 7/8 inch in sterling silver. Unlisted in 1991 Hawaiian Money 2nd Edition by Medcalf & Russell. This ingot was cataloged as FMI-PS03 in the latest update to my book https://www.createspace.com/5281076 An specimen is on the book cover. I found a copy of one of my earlier numismatic purchases. 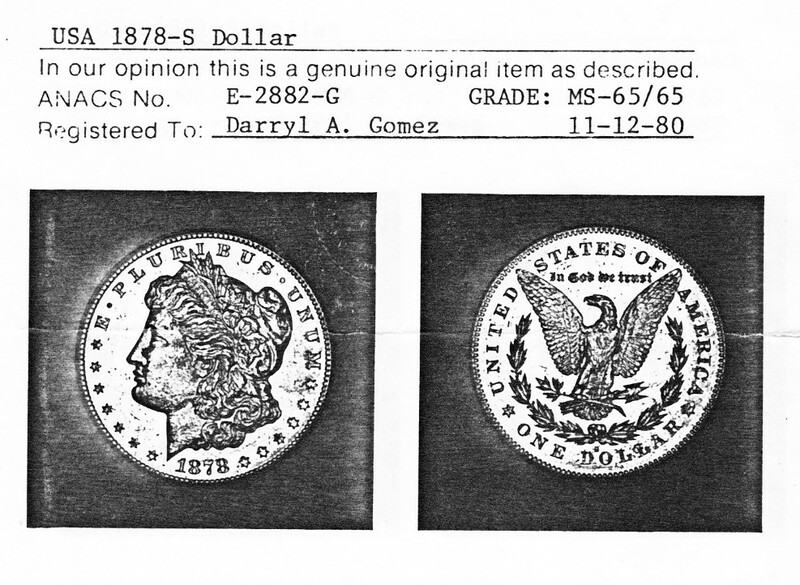 I purchased the coin from a Morgan silver dollar dealer in Montana. I paid $$35 for it and sent it in to ANACS for certification. It was deep proof-like with a very nice cameo effect. 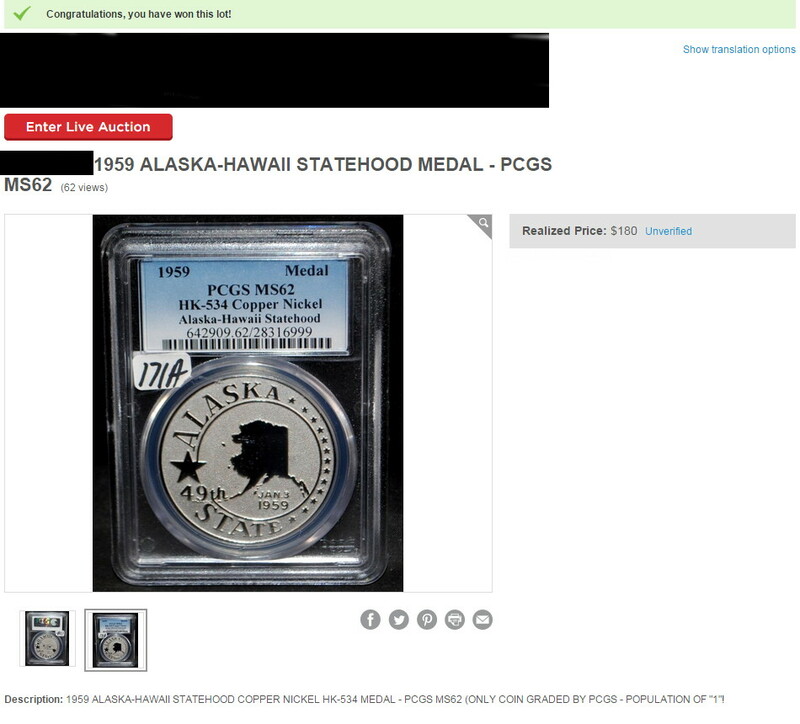 I later listed it through Steve Ivy (now Heritage Auctions). It sold and it help pay for my tuition (Bachelors degree). Hawaii Promotion Committee Link to HK-721 SCD? The 1904 “Automobile Floral Fiesta” (originally held on Thanksgiving day) evolved into the Floral Parade and moved to Washington’s Birthday (Feb 15, 1906). No parade was held in 1905. The name later changed to only the Mid-Pacific Carnival. The Mid-Pacific Carnival continued to spotlight the Hawaiian Islands until 1917. It was decided that the 1918 Mid-Pacific Carnival be held at an appropriate level (limited to athletic contests) due to the efforts of the U.S. in World War I. From 1904 through 1917, the primary motive of holding the event was to produce a revenue stream for the Hawaiian businesses (tourism and investments). The Hawaii Promotion Committee was in charge of the annual event. The Hawaii Promotion Committee was part of the Honolulu Chamber of Commerce. In order to promote the event, an annual contest (only for the years 1910 through 1917) was held to select a poster design. The winning poster design was printed into posters, postcards, and stickers. These three forms of media was sent throughout the world to publicize the event. 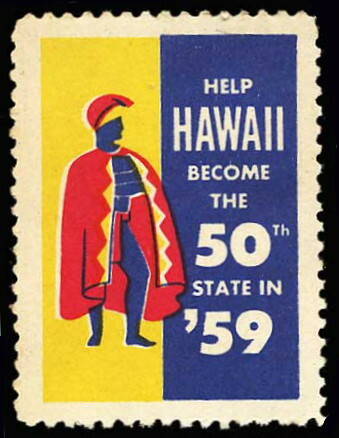 The stickers (name the Hawaii Promotion Committee used) are know today as “Poster Stamps”. The advance Hawaiiana specialist seeks the “design trifecta”, that is, own the poster, postcard, and sticker. This is an extremely difficult task to accomplish as most of the posters were trashed after the event. Stickers were attached to anything that was not moving. As for the postcards, they are highly prized by specialized collectors. It is my opinion that the posters and stickers are highly valued since many did not survive due to their uses as disposable advertising. The postcards were advertising on a form of written communication and kept after being delivered. The most highly prized design is the 1914 Mid-Pacific Carnival. 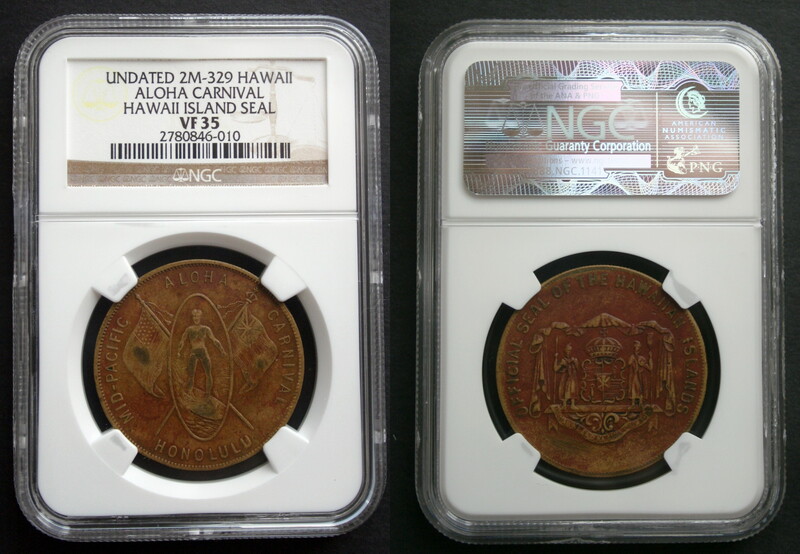 It features the father of modern surfing, Duke Kahanamoku. 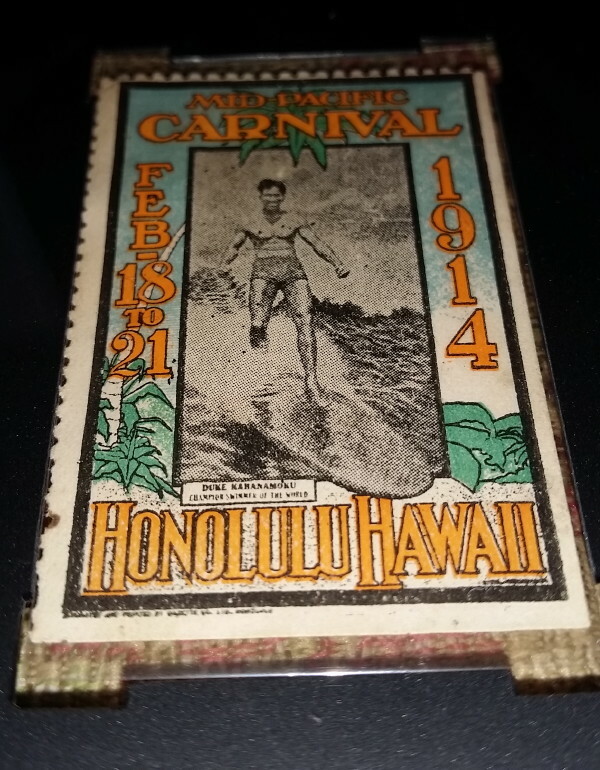 This is the 1914 Mid-Pacific Carnival Poster Stamp in my collection. Here is Duke in the same pose on a 1914 Mid-Pacific Carnival So-called Dollar (1 of 3 HK-721 SCD my collection). Also known as Admission Day. I just purchased this interesting original stamp label.